Noooooooo!!!!!! Say it ain't so??? You know I got the impression that the ASKAP data would start to trickle in within 4 or 5 years and POGS(or something like it) would be around at least untill then. Wasn't that supposed to be the reason they started Skynet in the first place? You know as a test phase so they could be ready for the massive amounts of data that would eventually need to be crunched when the Square Kilometre array started to come online? I wonder what changed? So... a last crunch at POGS sounds like a good plan Chooka. Universe can wait for another day. Of course I now wish I would have put more time into POGS but that's always the way, isn't it? As we all know there's never enough cores or hours in the day to crunch all the projects the way we would have liked too. We all have to choose to either do well at one or two projects or just do OK at a lot of them, even the big guys have the exact same problem as we do. Like most of us I choose the latter because it can get boring fast crunching the same project day in & day out year after year. It takes a special kind dedication to stay committed to just one project for as long as it takes. Anyhoo... i'll finish up my cache of universe then start crunching POGS as soon as I can. err that's "if" there is any POGS work to be had of course? Read your post and moved all my cores to POGS aand then found out there is no work ?? Left POGS active but started back on Universe. Yeah no work, that's what made me read some of the forum posts, I had noticed my credit had plateaued (woah that's a weird looking word). There's no official word yet, so maybe the project will had dribs and drabs forever more (reminds me of the MindModelling project), or maybe it will get that motherload of work from the ASKAP in a few years and everything will start up again. Oddly, I find myself feeling like i've lost a member of the family. Well done everyone, that's a huge amount of crunching the team has done on POGS. I too thought POGS and Sourcefinder were almost like a warm up for crunching the masses of data that is now coming from ASKAP and the even greater amount that will come from SKA. 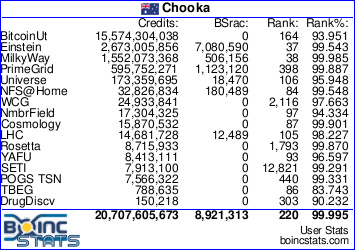 Live ASKAP data hits Galaxy - January 2017. Apparently not. Wondered why nobody had commented on POGS closing soon in the 2 months since it had been posted on Sourcefinder. Didn't realise that apparently I was the only one who posts here who had read it then. Should have mentioned it when I posted about my last little fling on Sourcefinder before it closes. Ahh that's a shame, I don't really feel I did enough work for POGS but as JugNut said, thats always the way. Just came to post that POGS is complete, but looks like everyone beat me to it. So - since we've now completed crunching, we must know all about life, the universe and everything. Yeah I don't like Gridcoin. I got all excited when I read this last comment from POGS admin, I thought for sure he was talking about a new boinc project called Astro Quest? I've posted to find out, but as yet no reply. The page for SkyNet POGS has the Team down as the number two team in the world behind Gridcoin which is not a Team so we are #1.